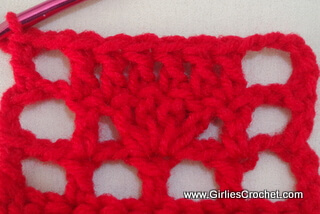 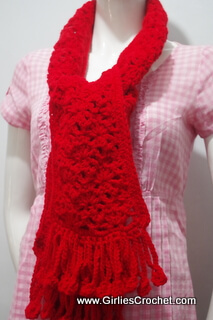 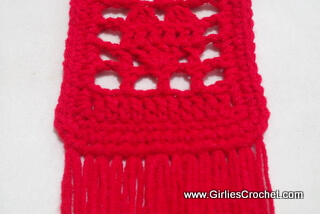 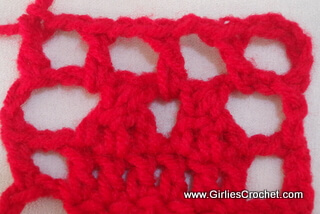 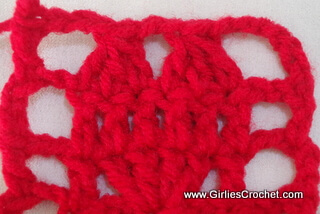 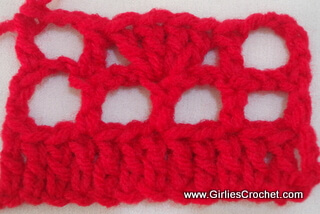 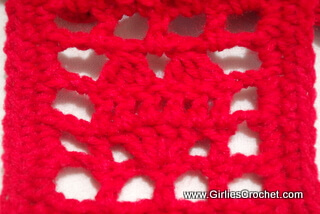 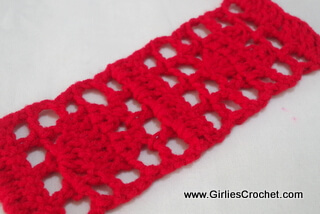 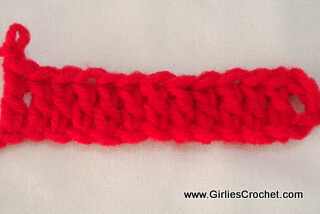 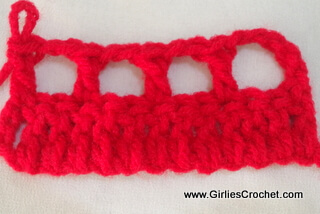 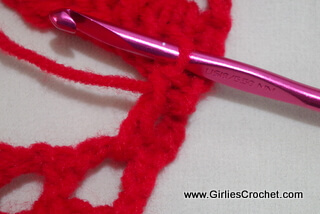 This Lovely scarf is a free crochet pattern for beginners using a heart shaped stitch tutorial. 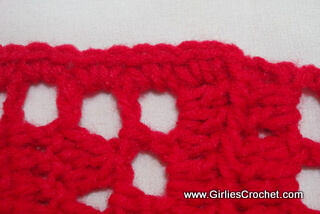 This stitch is multiple of 9 + 7 for turning chain. 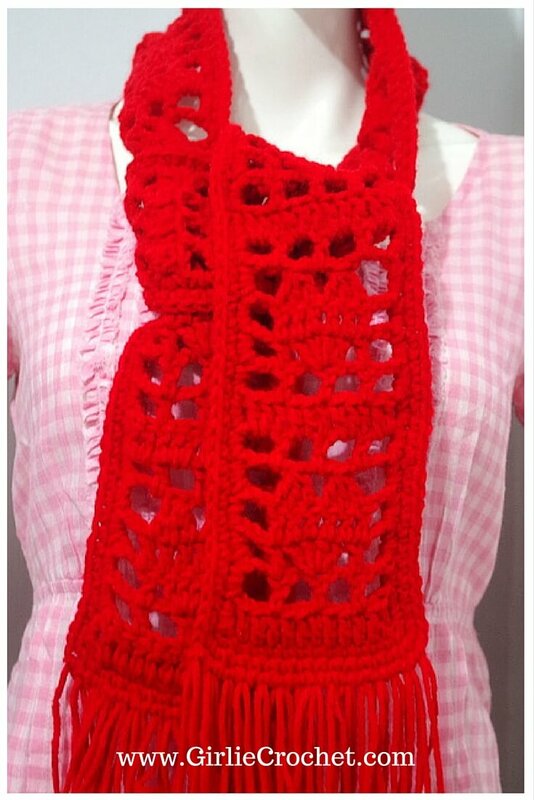 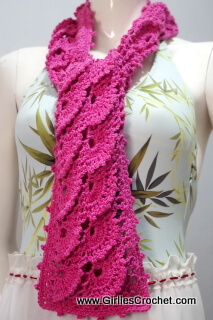 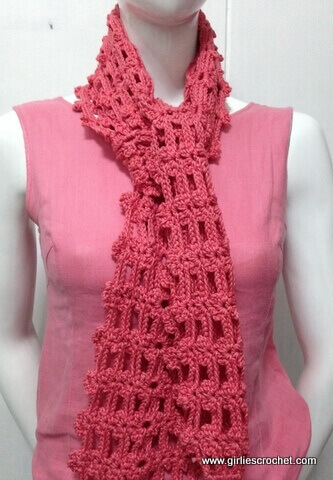 The scarf was crocheted in two pieces and connected to each other at the middle. 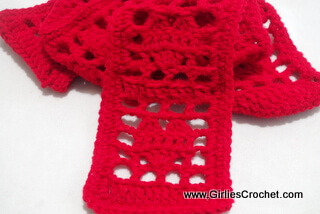 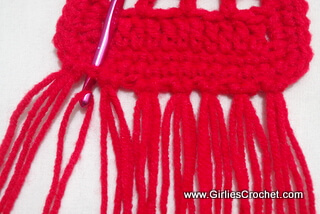 By crocheting the last row on second scarf, you will connect the 1st scarf as you go. 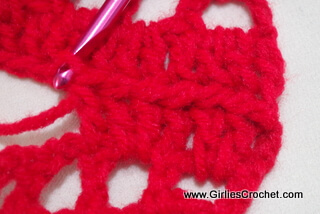 This method will make the heart shape in both sides align when its on your shoulder as shown on photo above. 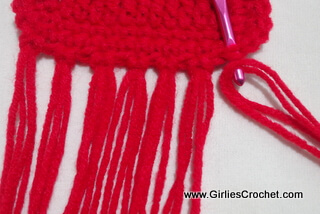 Optional: You may put tassel on both ends. 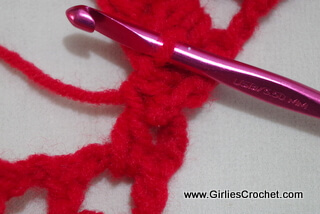 Dc3-tog: (Yarn over the hook, draw up a loop in next st, yarn over the hook, draw through first 2 loops on hook) 3 times, Yarn over the hook, draw through all 4 loops on hook: dc3-tog made. 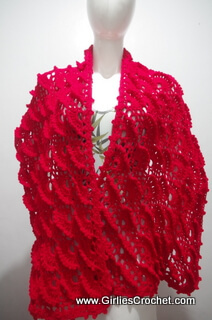 Row 3: Ch5 (consider as 1st dc and 2ch sp), turn, sk next 2ch sp, dc in next dc, sk next 2ch sp, 4dc in next dc, sk next 2ch sp, dc in next dc, ch2, dc in last dc. 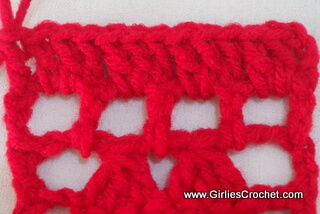 Row 4: Ch5 (consider as 1st dc and 2ch sp), turn, dc in each of next 6 dc, ch2, sk next 2ch sp, dc in last dc. 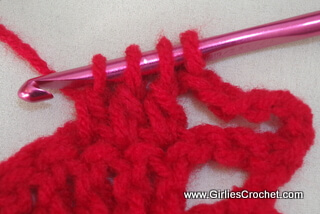 Row 5: Ch6 (consider as 1st dc and 3ch sp), turn, dc3-tog in next 3dc, ch2, 3dc-tog in next 3dc, ch3, dc in last dc. 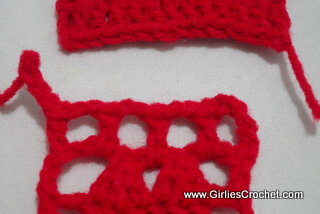 Row 6: Ch5 (consider as 1st dc and 2ch sp), dc in next 3ch sp, ch2, dc in next 2ch sp, ch2, dc in next 3ch sp, ch2, dc in last dc. 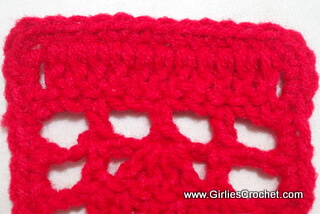 On the second piece of the scarf, repeat the lovely scarf instructions up to row 42 by repeating row 1-7, end with row 6. 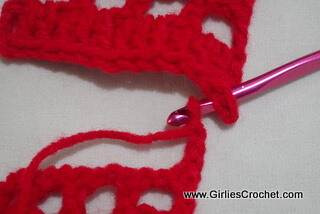 Row 43: Repeat row 7 but this time, you will join the two pieces together as you crochet this row. .
repeat the process as shown in photo below. 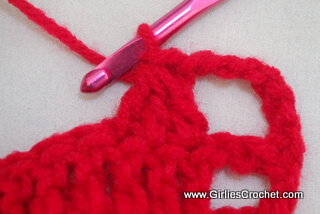 Do not cut, continue on to edging. 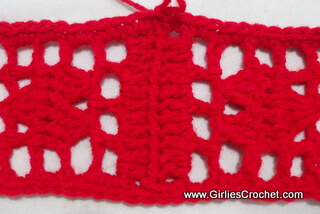 Row 1: Ch1, (2sc in next dc post) around, but having 2sc in the corner and sc in each dc on both ends, end w/ sl st in 1st sc to join. 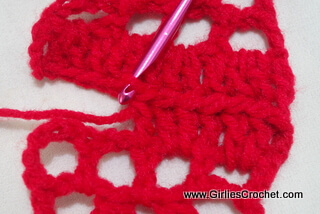 Row 2: Repeat row 1 but this time, 3sc in all corner sc.